Wensleydale Cheese is widely available through most supermarkets these days and a firm favourite of many cheese lovers due to its mild, creamy and slightly sweet taste. However, not all Wensleydale cheese is actually produced in the Yorkshire Dales! There is actually only one authentic creamery producing Wensleydale cheese in Wensleydale itself, which is located in Hawes. 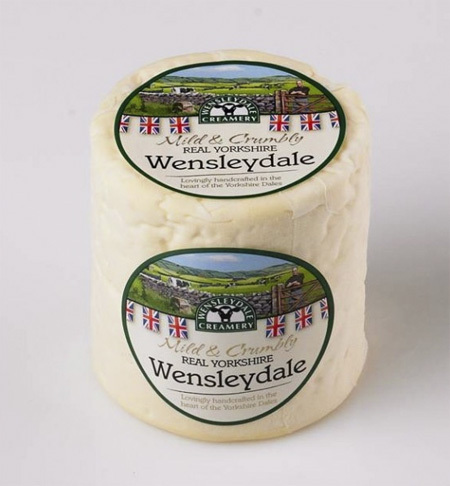 Other creameries throughout Lancashire and Cheshire also produce ‘Wensleydale’. Due to this fact, the Hawes creamery, wishing to keep the cheese’s name synonymous with quality and ancient handmade traditional production, has applied for the “Protected Geographical Indication” status for their Real Wensleydale Cheese. Real Wensleydale Cheese from the Hawes Creamery is a mild and creamy cheese. The creaminess is attributed to the milk used from local dairy cows, whose diet contains limestone pasture grasses, herbs and wild flowers found only in the Yorkshire Dales. It is a delicate cheese, initially slightly sour and with a honeyed and sweet aftertaste. It is distinctively moist, crumbly and flaky in texture. As Real Wensleydale has a slightly sour flavour and the honeyed aftertaste, it is well suited to being coupled with something sweeter. The Hawes creamery and other producers of Wensleydale often couple it with infused fruits – apricots or cranberries. It also works well sliced on top of fruitcake, and in the Yorkshire Dales themselves is served with apple pie.